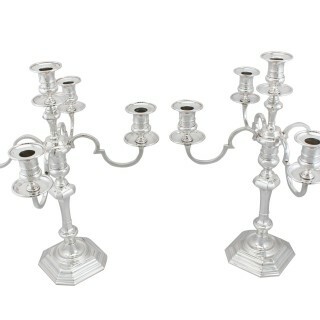 A magnificent, fine and impressive pair of antique George V English sterling silver five light candelabra made in the George I style; an addition to our ornamental silverware collection. 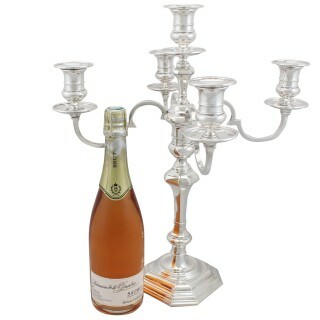 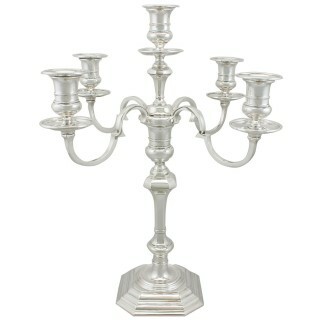 These magnificent antique George V sterling silver 5 light candelabra have a plain circular form, in the George I style. 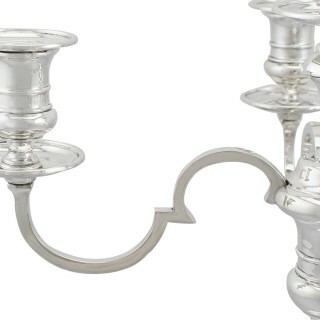 Each impressive candelabrum retains the original hallmarked detachable push fit scrolling arms, which support rounded waisted capitals with plain, hallmarked circular dished drip pans. 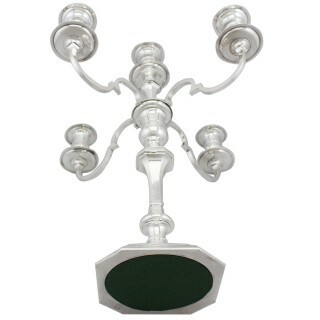 Each candelabrum is fitted with two pairs of labra, secured with a central elevated capital. 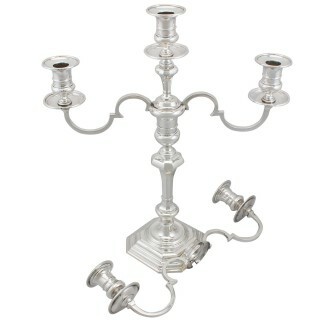 These versatile antique candelabra can be used with five lights, three lights or as candlesticks once the arms (labra) are detached. 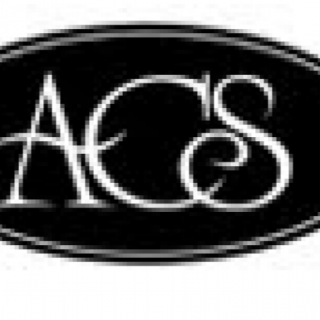 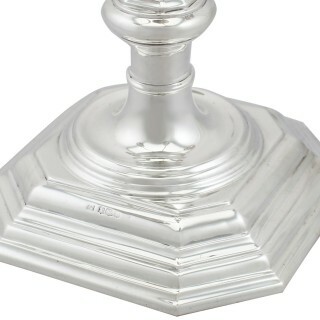 The knopped stems are surmounted on sunken wells, to square cut cornered spreading bases. 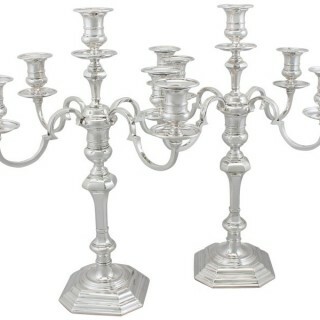 The five light silver candelabra/candlesticks have weighted solid hallmarked sterling silver bases; this is a sign of quality in such pieces. 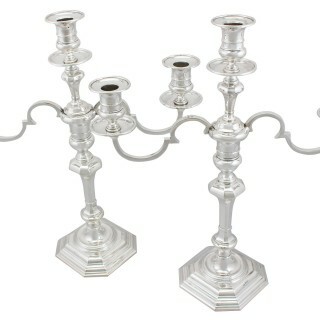 These candelabra, crafted by the renowned 20th century Sheffield silversmiths Thomas Bradbury & Sons Ltd, are highly desirable due to their versatile lighting arrangement. 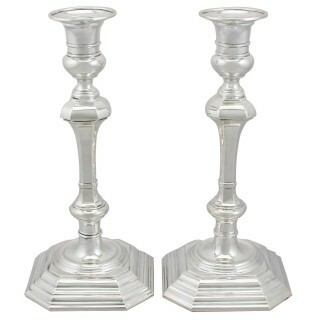 * A total weight cannot be provided as the candlesticks have weighted bases. 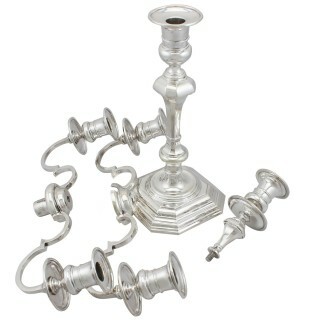 These antique 5 light candelabra are an exceptional gauge of silver, exceptional quality and in exceptional condition. 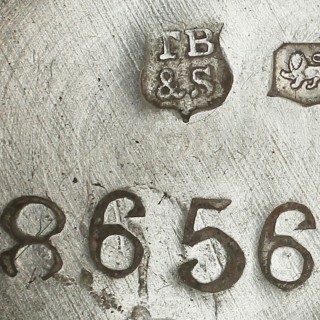 Full hallmarks struck to the surface of each base are clear in keeping with age and location. 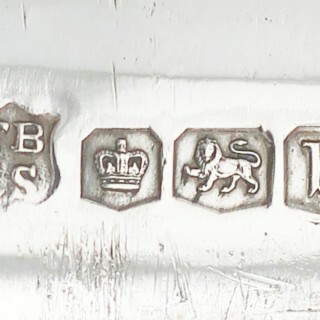 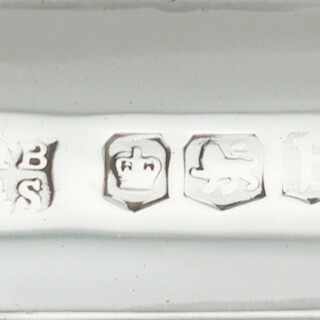 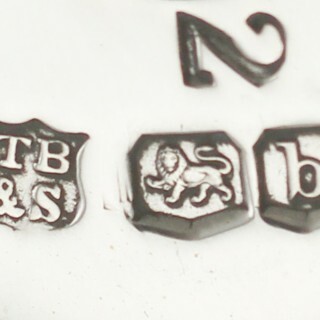 The full hallmarks to the central boss and part hallmarks to the sconces, labra and underside of each base are all very clear; the hallmarks are struck deeply due to the exceptional gauge of silver.